By double digits, yet! And that's, what? 8 in a row? 9? I'm losing track the way Bernie's just been burning it up. Nate Silver seems to have blown a fuse or something. Didn't he give Hillary a 78.5% chance of winning Wisconsin? Hoo-boy, he's been getting a lot of States wrong this year. And now 16 States for Bernie, 17 for the queen? And at least 2 of hers were really virtual ties, if I remember correctly. She owes everything to southern-state African-Americans. Everything. It's absolutely bizarre when you think of how much suffering they have endured because of Clinton Democrats. Spike Lee is still shaking his head in disbelief about those deep-south primary results. it doan matter. she'll come on and say she won anyway. From what I read, she decided to have another private big-donor dinner in NYC instead. they're the only block dumb enough to vote for her. Sanders' disastrous meeting with the New York Daily News points up even more similarities between him and Donald Trump. Stump speeches, slogans, absolutely no understanding of policy. Break up the banks, build the wall, free tuition -- all meaningless slogans with no understanding of how to do anything. Pretty scary. Two dangerous and very similar men: Trump and Sanders. Actually, the exit polls showed much higher ratings for Clinton for honesty -- well over 50%. And of course I think Mr. Cruz is honest and trustworthy. If he weren't, I wouldn't be so terrified of him! The bottom line here is that HRC is NOT a good politician. With all the backing of the Dem establishment and the media she shouldn't be in such battle with a self described "socialist". Dems should be worried that even with the GOP so fractured she will beat herself in November. The above poll was on CNN this morning. Take it as you will. 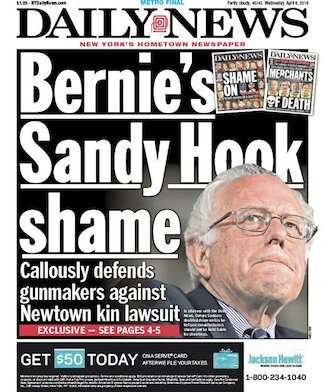 As for the NY Daily News article, CNN had two people from the Bernie campaign on this morning who made it quite clear that the people who wrote that article didn't understand the issues and Bernie's response which they completely stand by was correct and defensible. I couldn't go into it as they did as I am not an economist. You would just have to see their responses in that interview in which they repeated Bernie's answers. And one even pointed out that his position was no different than Clinton's which the NYDN characterized as uninformed. It is unfortunate that people take these stories at face value and run with them. The irony being people think a socialist is trustworthy and honest. Bernie has run with the right-wing Republican attitudes about Hillary -- ready made for him. Bernie's votes against gun laws are well documented. It's unfortunate that Bernie supporters can take no criticism of their unicorn. I listened to the audio of the Daily News interview -- it's very scary. Just like Trump not knowing what he's talking about. But Bernie's people are good at sophistry, I'll give them that. A socialist can certainly be trustworthy and honest. But I don't think Bernie and many of his supporters are either of those things. I have said in the past that I do not agree with Bernie's past stance on gun laws but I guess that was not convenient to the unicorn narrative. My wife prefers Clinton. We are not seeking a divorce. I certainly remember that you said that. I was speaking of Bernie supporters in general. I think you (or was it someone else?) who asked one of our resident Trump worshippers if there was anything he didn't like about Trump. I think Trump is a unicorn to them. That seems to me to be another thing Bernie and Trump have in common -- the fact that their supporters can't see any flaws in their candidates. But I'm not referring to you, Bogie, as I do recall your concerns about Bernie and guns. I am loath to get in the middle of these testy exchanges, but I have to speak up. Swithin, you keep using the "unicorn" label to go after Sanders supporters, but I don't think you got the original intent of the usage of that word by darkblue. It wasn't that he was calling Bernie "holy/sacred" or "infallible" but that he was saying that Sanders was as "rare as a unicorn", for whatever reason, perhaps for his stance against big-money donors or his open espousal of socialists ideals, both of which are extremely rare in the modern American political sphere. Unicorns are known for being rare. They are not, as far as I know, usually ascribed infallibility or holiness, which seems to be the attribute you have bestowed on it. Just my 2 cents. There are critical remarks to made about all of the candidates, but if you are disingenuous about it, it kind of sabotages your point of view in the eyes of others. has the NY daily news held HRC to her pronouncement several debates ago that she would be forthcoming with those goldman-sachs transcripts??? Thanks for your POV, Larry. I'm sorry that people insist on bringing up these sensitive political threads, but if they must start these threads, I will certainly help populate them! Darkblue chose that word carefully and went on in that thread (as I recall, I think it's gone now) to emphasize Bernie's uniqueness. He made him sound almost infallible -- he may even have used that word, although I don't remember exactly. Bernie's supporters persist (as Trump's supporters do) in positioning their candidate as"rare as a unicorn," meaning he's not a typical politician. My point is that Bernie is most definitely a typical politician. Each candidate may have his/her unique features, but they are all politicians, and Bernie and Trump are (for me) at the top of the list. As far as sabotaging my point of view in the eyes of the others -- there is no arguing with Sanders or Trump supporters. That may be the real unicorn-like feature of those two candidates and their supporters -- an unprecedented inability to accept disagreement. "Approximately two-thirds of American voters say the U.S. needs “radical change,” according to an April 5 Quinnipiac University poll. When asked what they thought about the statement “the old way of doing things no longer works and we need radical change,” the survey found that 64 percent of voters agreed. The responses were split up based on party and on voters’ candidate of choice. 71 percent of Republicans agreed that the U.S. needs radical change; so too did 58 percent of Democrats. Supporters of every presidential candidate expressed desire for radical change, save for one. The only exception? Hillary Clinton." I actually believe that, and agree. I think the media (mainstream, talk radio, non-mainstream) and others whip people up into a frenzy, particularly in turning people against Washington. That has led to some dangerous situations. I think Hillary supporters recognize how dangerous that mode of communication is. It leads to situations such as Oklahoma City, that recent situation in Oregon, and things that may seem less toxic but in the long run lead to violence. The old way of doing things certainly doesn't work. The evidence is there for almost everyone to see. Clinton of course would not wish for "radical" change, which does not need to be defined by violence by the way, as she is a guardian of the current world order. These guardians paint change as 'dangerous' - ooh, so scary, so they can protect this world order for the top 1%. It's actually much less than 1% in reality. I actually just read that poll. It said a lot more than what you quoted. Here it is. If you want to refer to a poll that also says "America has lost its identity," you have to question what that really means. The radical change that many people want has nothing to do with banks! A total of 57 percent of all voters "strongly agree" or "somewhat agree" with the statement, "America has lost its identity," as 43 percent "somewhat disagree" or "strongly disagree." Among all Republicans, 79 percent agree, while only 36 percent of Democrats agree. The highest level of agreement is expressed by GOP supporters of Donald Trump, as 85 percent "agree," the independent Quinnipiac (KWIN-uh-pe-ack) University Poll finds. Among all American voters, 57 percent agree with the statement, "I'm falling further and further behind economically," with 67 percent of all Republicans and 48 percent of Democrats agreeing "strongly" or "somewhat." Trump voters stand out with 78 percent strongly agreeing. The pattern continues as 62 percent of all voters, including 85 percent of all Republicans and 40 percent of Democrats agree that their "beliefs and values are under attack." Ninety one percent of Trump backers agree, the highest of any candidate. There is widespread agreement, 76 percent, with the statement, "Public officials don't care much what people like me think." Agreement is 84 percent among all Republicans and 68 percent among Democrats. Ninety percent of Trump supporters agree, the highest of any candidate. There is a lower level of agreement, 64 percent, with the statement, "The old way of doing things no longer works and we need radical change." Agreement is 71 percent among all Republicans and 58 percent among Democrats. Agreement is highest among Trump supporters with 83 percent. Among all American voters, 56 percent agree with the statement, "Leaders don't worry about what other people say; they follow their own path." Agreement is 65 percent among all Republicans, 46 percent among Democrats and 74 percent of Trump voters agree, the highest of any candidate. Socialism is good until you run out of other people's money. What would you do without your fire department, medicare and social security? You don't have to be an extremist to like some socialist schemes. You sound like a brainwashed McCarthyite.